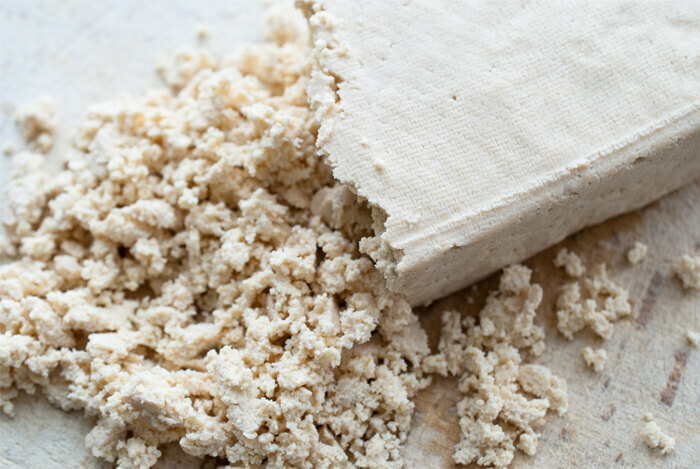 Squishy, rubbery, bland…I bet those are just three words that many of you associate with tofu. It seems people either absolutely hate or absolutely love this soybean curd. I’ll admit I belonged to the former category until I began experimenting with different tofu recipes. Since then, I’ve discovered some incredibly tasty tofu dishes. Who doesn’t like Mexican food? It’s awesome…spicy, filling and super tasty. These tofu tacos from Whole Foods Market tick all the boxes and then some. The original recipe calls for a topping of shredded cheese but I tend to leave it out to cut down on saturated fats. Instead, I replace it with my favorite source of healthy fats – sliced avocado. Two tacos clock in at around 350 calories with 8 g of fiber and a huge 20 g of protein. Not too shabby for a meat-free meal. It’s also good for those who insist on counting calories! And, leftovers can be easily packed up for a quick and easy lunch the next day. Heat oil in a large skillet over medium heat. Add garlic and two-thirds of the green onions and cook until fragrant, about 2 minutes. Add tofu mixture and cook, stirring occasionally, until most of the moisture has evaporated, 10 to 12 minutes. Add beans and remaining green onions, stir well and cook until beans are heated through, about 2 minutes more. Spoon tofu mixture into tortillas, top with lettuce, tomatoes and serve. This awesome recipe comes from Rachel Ray. Bok choy – also known as Chinese cabbage, one cup of cooked bok choy contains more than 100% of our recommended daily allowance (RDA) of vitamin A, and almost two-thirds of the RDA of vitamin C.
Ginger – this unattractive root is a superfood in hiding. Soba noodles – made of buckwheat, these nutty tasting noodles are high in fiber and are free from fat and cholesterol. Cook soba noodles according to package instructions, adding snap peas during the last minute of cooking. Drain and rinse under cold water; set aside. 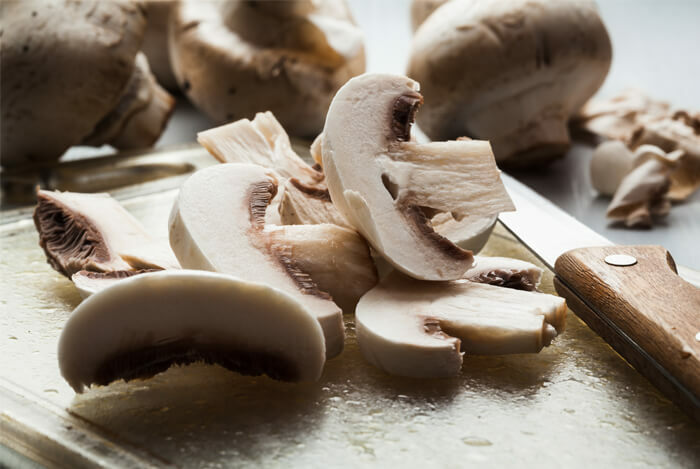 In a small bowl, combine the soy sauce, rice vinegar, sesame oil, ginger and 1 tbsp of cooking oil. Reserve 3 tbsp of the sauce for basting. Thinly slice the white part of the green onions. In a medium bowl, toss the sauce with the noodles, snap peas and onion whites. Preheat a grill pan to medium-high heat. 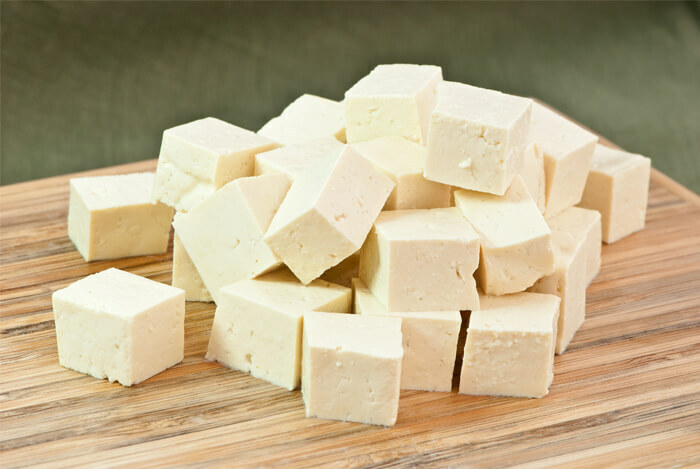 Cut tofu in half horizontally, then cut each half into 12 pieces. Thread tofu and bok choy onto 8 skewers. Brush with 1 tbsp oil and grill until lightly browned. Flip skewers, baste with reserved sauce, and grill until browned. Transfer skewers to a plate and tent with foil. Cut the green part of the green onions into 2 inch pieces and toss them with the remaining oil in a small bowl. Grill, turning, until softened, about 3 minutes. Serve kebabs and noodles topped with scallion greens. 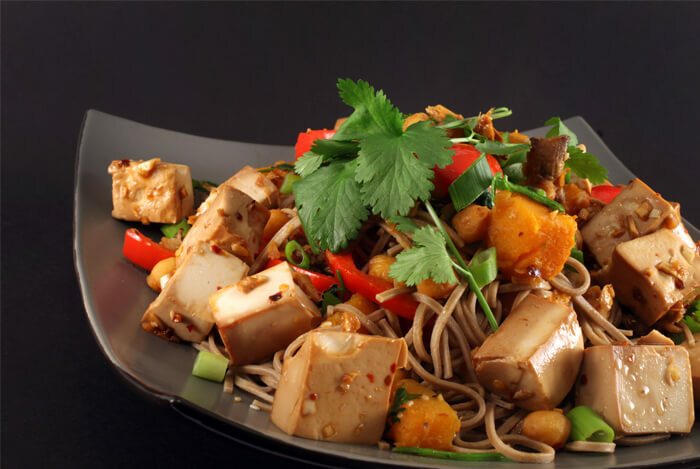 This stir-fry recipe from Fine Cooking is what I consider to be a typical Asian dish – noodles and vegetables along with amazing flavors, which are soaked up by the tofu. The original recipe calls for Asian-style noodles like udon. But as ever, I like to make a few little modifications. I’ve switched these up for some black bean noodles – made purely of black beans and water. They’re high in protein and fiber and a serving contains 26% of my daily iron needs. They’re also gluten free and have almost no sodium, saturated fat, or cholesterol. Whisk the soy sauce, sugar, lime juice, sriracha, garlic, and 2 tbsp water in a small bowl; set aside. Heat 1 tbsp of oil in a wok over medium-high heat, add the tofu, season and cook, stirring occasionally until browned on all sides, 3 to 5 minutes. Transfer to a large bowl. Add another tbsp of oil to the pan, and then add the carrots. Season and cook until crisp-tender. Add to the bowl with the tofu. Add the remaining oil, the cooked noodles and green onions to the skillet. Cook, stirring occasionally, until the noodles are browned in spots and the green onions are tender, 2 to 3 minutes. Stir the sauce and then carefully pour it over the noodles. Toss well to coat and cook, stirring, until the sauce is reduced to a sticky glaze, about 2 minutes. Return the tofu and carrots to the wok. Add the cabbage and toss well. Serve with lime wedges and additional Sriracha if desired. What I like about this soup recipe from Steamy Kitchen is that you can just add in whatever leafy green superfood you have lying around. I like spinach best in this recipe but any will work. Spinach in particular provides iron and calcium. This soup is perfect for when you’re a little under the weather, or even hungover! In a pot, bring the broth to a boil. Add tofu, mushrooms and the vegetables. While stirring, slowly pour in the whisked egg. Cook for 2 minutes. Remove the pot from the heat. Add about 1/2 cup of the hot broth into a bowl with the miso paste. Stir to soften the miso paste. Pour back into the pot and stir gently. Top with green onions and serve immediately. These mini frittata’s from PBS Food work for breakfast or lunch and are ridiculously tasty. They’re a little bit like the Vegetable Egg Bites featured in my Healthy Breakfast article, but using tofu instead to form the base. Black olives are an excellent source of healthy fats, particularly monounsaturated fat. Preheat oven to 375F. 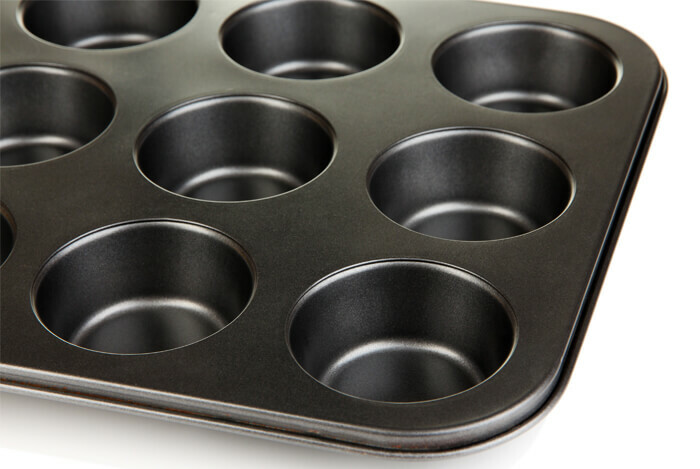 Lightly grease or line 8 cups of a muffin tin. Add oil to a large skillet and heat, then add chopped onion and red pepper. Sauté for 5 to 7 minutes until vegetables have softened. Add garlic and sauté for one additional minute. Season veggies with salt and pepper and add olives, spinach and basil. Set aside. Scoop out 1/8 of mixture at a time and add to each cup of the muffin tin. 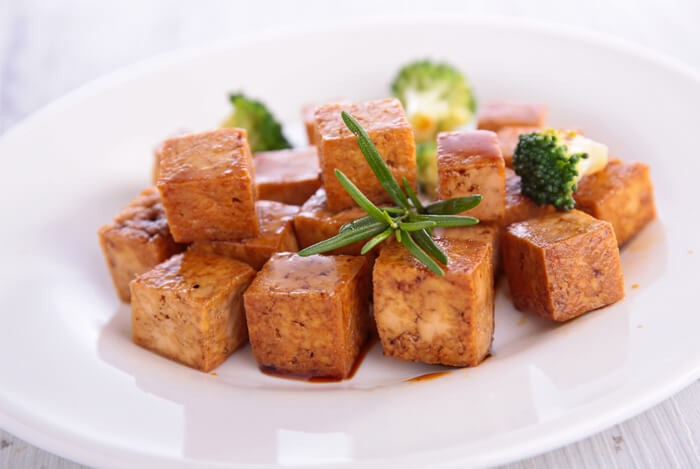 If any tofu dish could fool you into thinking you’re about to eat meat, it’s this one from Divine Healthy Food. I just blitz a little bread in the food processor and I’ve got breadcrumbs in 10 seconds – simple! You could also try ground up nuts or even oats. Serve it on a bed of kale – chock full of antioxidants, calcium, magnesium, and copper. Carefully cut the tofu block in three layers, then slice across to make 6 small rectangles. In a small bowl, mix soy sauce, tomato paste, miso paste, olive oil and maple syrup. Pour the breadcrumbs on a separate shallow dish. Dip the tofu steaks in the sauce, then quickly coat them with breadcrumbs. Spread some cooking oil on a ribbed grill pan at medium-high heat and cook the tofu steaks for about 10-13 minutes until brown on one side, then flip and cook the other side for another 6-10 minutes, until browned. 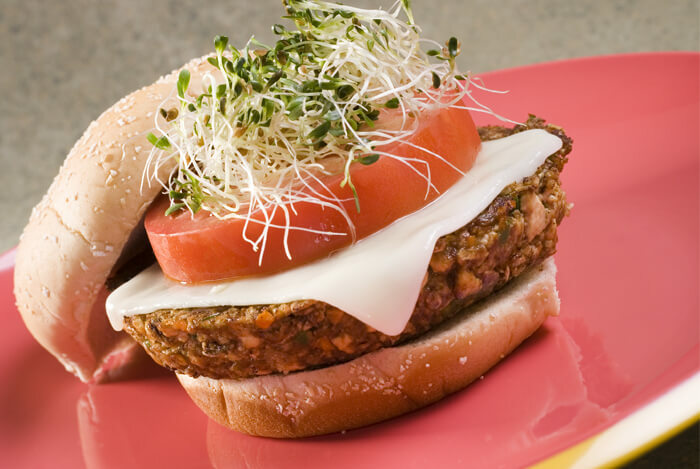 Bored of black bean burgers? I don’t blame you – they’re getting a bit old. Go back to basics with this tahini topped tofu burger from NDTV Food. Well, it’s not all that basic – it still packs in a lot of flavor. Tofu is blended with chickpeas, roasted nuts, and vegetables to form the patty, and the lemon and garlic tahini packs an extra punch. Sauté the garlic and cumin in cooking oil. Add the carrots, celery, onion and sauté for a few minutes. Grate the nutmeg over the vegetable mixture. In a bowl, add tofu, chickpeas, soy sauce, roasted nuts, 1 tablespoon of tahini paste, salt, pepper, bread crumbs and mix well by hand. Fold in the vegetable mix. Mold the mixture into burger size patties and fry in the pan until golden brown on both sides. To make the garlic tahini sauce, mix ingredients in a bowl until smooth. Spread tahini paste on the toasted burger buns. Add salad leaves and other toppings of choice. Have you turned veggie and now you’re missing your favorite Chinese takeout option – General Tso’s Chicken? Never fear, I’m here to save the day by sharing this recipe by Appetite for China. 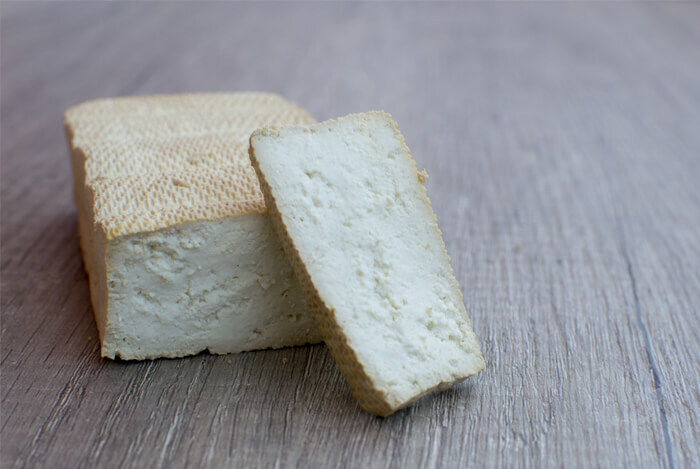 Rinse, drain and pat dry the tofu, then cut into 1-inch cubes. Bring a medium pot of salted water to boil. Add the broccoli and cook for about 2 minutes. Prepare the sauce by stirring together all the ingredients in a small bowl. Heat 2 tbsp of oil in a wok or large skillet over medium-high heat. Add the tofu in one layer (you may have to do this in batches) and cook until golden on all sides. Transfer to a plate. In the same pan, add the remaining oil, dried chili, garlic, ginger and green onions and stir-fry for 30 seconds. Pour in the sauce and stir until thickened, about 1 minute. Add the tofu and carefully toss to coat with the sauce. Serve with broccoli and brown rice and sprinkle the sesame seeds and onion greens on top. What the heck is black rice I hear some of you ask? Well, it’s much like its cousin brown rice, which we all know is a great complex carb, giving you prolonged energy. 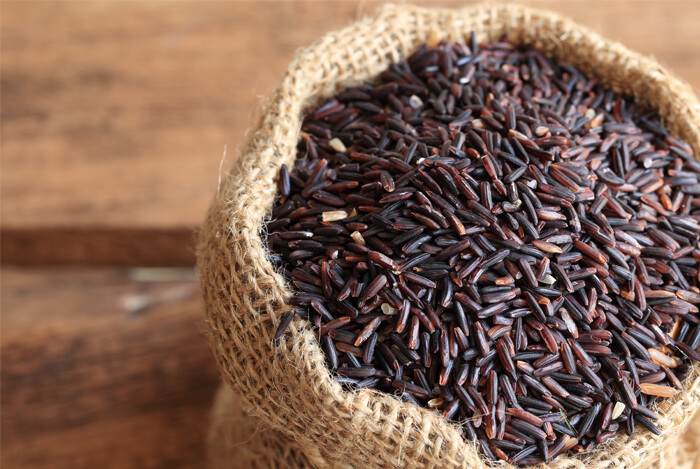 In addition to all the health benefits that brown rice brings to the table, black rice carries some serious antioxidant power. With this superstar rice, you’ll feel on top of the world after trying these little cakes by Wholly Vegan. Mash the tofu by hand in a large bowl. Add onions, bell pepper, rice, peanut butter, tamari and sesame oil. Season to taste. If it feels dry and crumbly, add a little more peanut butter and sesame oil. Form into 1 & 1/2 inch balls and flatten a little. Fry in a thin layer of oil until browned on both sides. Drain on paper towels & serve. 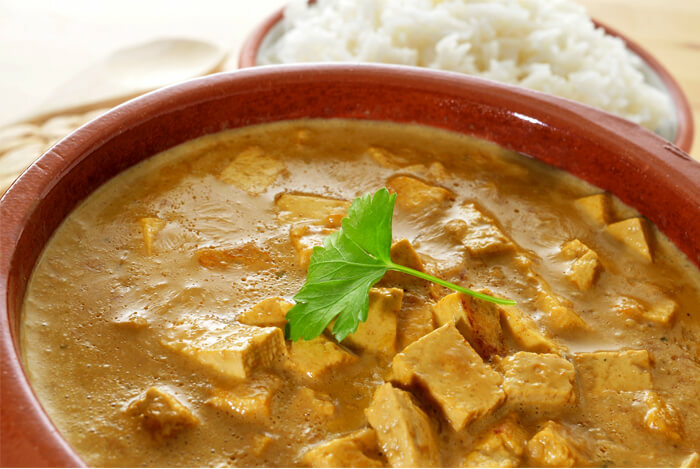 Since tofu is like a little sponge, soaking up all the flavors around it, I had to include this awesome curry, courtesy of Holy Cow. This dish is colored by a potent blend of spices such as turmeric, cumin, cinnamon, cardamom, and coriander. Mix all the ingredients for the tofu marinade, slather on the tofu and set aside for 30 minutes. Add some oil to a cast-iron griddle, place the tofu in the pan and cook until golden-brown on each side. Remove to a plate and, when cool, cut into ¾-inch cubes. Set aside. To make the Makhani curry, heat a little oil in a saucepan. Add the cumin seeds, and when they sputter add cardamom, cloves, peppercorns and cinnamon. Sauté for a minute over medium-high heat. Add the onions and a little salt and sauté until the onions start to brown. Add ginger and garlic pastes, fenugreek and cashew nuts and sauté for another minute. Add the tomatoes and tomato paste, powdered coriander, turmeric, and chili powder. Sauté the mixture until the tomatoes turn really soft and melt into the saucepan. Add some water if mix gets too dry. Once done, turn off the heat and allow mixture cool. Pour into a blender with a cup of vegetable stock and blend to a smooth paste. Return to saucepan, turn on the heat, add the remaining vegetable stock if the mixture is thick, and bring to a simmer. Add the tofu cubes and stir them in. Add salt to taste. Let the mixture simmer for about 10 minutes. Add the butter and turn off the heat. Stir to melt the butter into the sauce. Add the lemon juice and maple syrup, mix well, garnish with coriander leaves, and serve hot with some brown rice. Tofu is so versatile it can even be used in smoothies. It adds a nice bit of protein especially if you’re vegan. 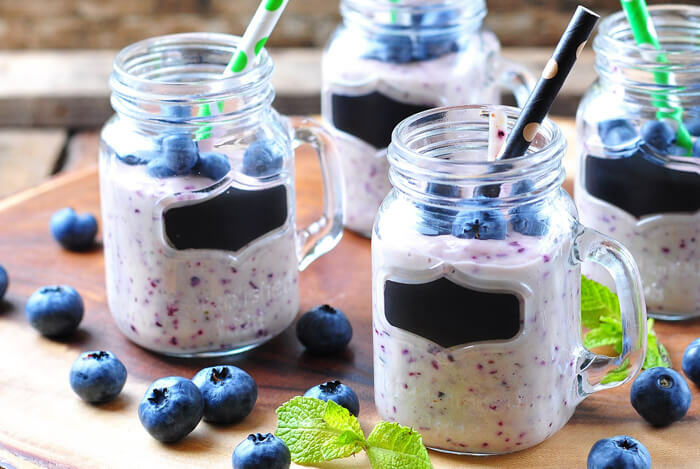 With three nutrient packed foods – blueberries, banana and spinach – you can’t go wrong with this recipe by Skinny Ms.
Smoothies aren’t the only surprising way to use tofu, it’s also used in vegan desserts like cheesecake, chocolate pie, puddings and cupcakes. This tofu dessert by Sugar and Cinnamon isn’t quite as indulgent, particularly as it’s free from added sugar. 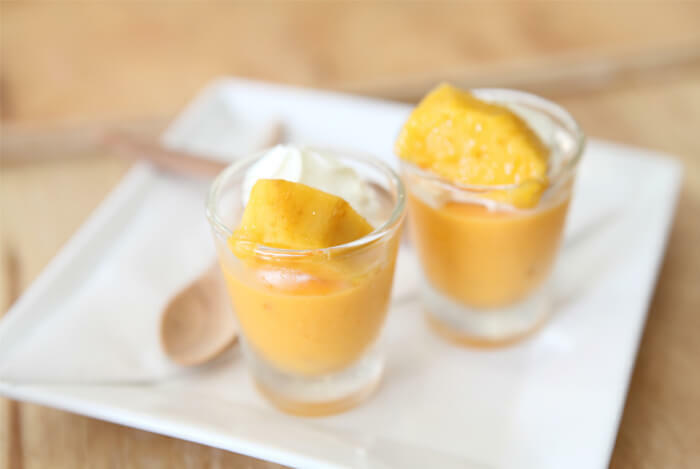 But it’s healthy, creamy and tasty and will keep the sugar cravings at bay. It’s also gluten free. Blend all the ingredients together until completely smooth. Divide into glasses and chill until completely cold and set. What’s your take on these tofu recipes? Have anything else you’d like to share? Let me know in the comments below!